The time has arrived to reveal the identity of the puppetmaster behind my paintings of Orly Taitz giving birth to delicious pancakes. By Friday, all shall be known. Unfortunately I didn't make my Kickstarter goal for funding the show, so no posters, programs, newer large canvases, etc. The show on Sunday will be paid for mainly through my auctions of Michael Jackson paintings (Thanks, MJ.) 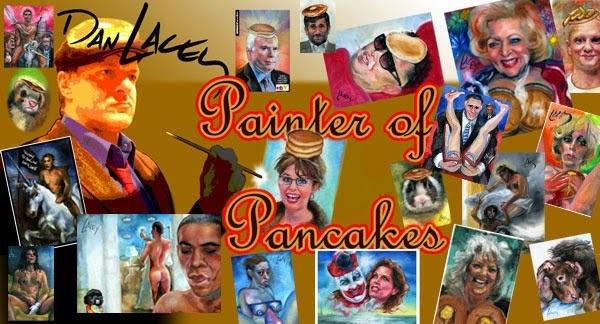 It will feature a number of new Orly paintings, including the painting above and a reproduction of the nortorious birther pancake, but the majority of the show will be comprised of framed reproductions on canvas of past pancakes, including a very healthy dose of Minnesota-themed paintings. You will be able to purchase the actual exhibits at the show for $20 each. However, you are still able to purchase a 'donation of chance' for $2.37, which will enter you in the drawing to win the puppetmaster Orly painting. Donations will also be accepted at the show itself, which will be held from 11 AM to 3 PM at Storefront In A Box on Lyndale Ave. in Minneapolis on July the 4th. Drawing will be at 2.37 conducted by Mr. Dusty Trice. Michael Jackson shedding tears of peace. I'm planning on adding a little more detail and shading to this painting before the auction closes. A portrait of a matador being gored by a pancake. A portrait of Michael Jackson which I call 'Strands & Tears." This Friday will be the one year anniversary of Michael Jackson's death. With the winning bidder's permission, this painting will appear in my 'Colors Of Orly' art show in Minneapolis on the Fourth Of July. The winning bidder receives both the painting and a signed pic of the artist with the painting at the show. I meant El Greco's second Annunciation from his Spanish period, but that's okay. I like the first one too. A portrait of partial face transplant recipient Rafael of Spain, with pancake. I started a video blog last week, but I think now that having two blogs is too much. We first met in my parent’s living room and even then you seemed taller than I. Your sitcom father had saved you and your brother from some implied lesser fate, but even then you seemed a guest in your own home. You as Arnold fought assimilation every step of the way, always too clever for what was good for you, the running gag of your life. Choosing to play your second act as a mere mortal, we were amazed that you deemed to have the same problems as us, although your challenges were far greater. For every day a mindless machine reminded you of your dependence. The world was built for taller men, for whiter men, for healthier men than you. And then life wrote you out of the show using a hastily written plot device that no one seriously believed. Did life get tired of you asking for more money? Were you difficult to work with? While painting at the Rio Hotel in Las Vegas I met your TV sister, a face parked over the shoulder as many before but instantly recognizable. “I’m Dana Plato,” she said. “and I really like your portraits.” I hope, Gary, that she likes your portrait as well. -but that same oil doesn’t help much of anything if you excrete it by the truckload into the Gulf of Mexico. Greetings, I’m Dan Lacey, The Painter Of Pancakes. Long after their mysterious demise, dinosaurs continue to extract a merciless revenge against the rightful inheritors of the planet earth, first by providing the lubricant for earthquakes, and now by expelling the syrup of their dead into the swimming hole of the living. As fast as we are able to unearth and destroy this evil resource, brave enterprises such as British Petroleum discover secret sewers of the stuff, and now our worst fears are manifest. As are many in the artistic community, I’m profoundly concerned about what this catastrophe might mean for me. Now I offer you, not jut an amazing work of art, but a plan; one which could transform our fragile coastal waterways into kaleidoscopes of color and wonder. If you are blue about the goo, then perhaps my artwork may be of some assistance. This original 6 by 9 inch oil over acrylic painting on actual sheet canvas shows the plume of oil from the Deepwater Horizon accident if it were tinted with a variety of fabulous industrial strength dyes and with a pancake on its head. What was formerly a spew of lingering destruction now becomes a beautiful experience which promises to delight our fragile low lying coastal wetlands and beaches for decades to come. This is a Jackson Pollack painted from the bottom up, by Mother Nature herself, with a little help from Sherwin Williams. I hope you’ve enjoyed this special collectible created just for you, the winning bidder. To the unsuccessful art collector may I say that I deeply appreciate your efforts, and that your special treasure awaits just around the bend. This is Dan Lacey, wishing you good art, and good pancakes.